This is a man who wanted to lessen the appearance of the prominent red blood vessels at the corners of his nose, Her underwent three Intense Pulsed Light (IPL) treatments with a special micro adapter designed to treat each individual blood vessel without affecting the surrounding nromal skin. This increases the effectiveness of the treatment, and also minimizes the downtime and redness by limiting any inflammation to the blood vessels themselves. 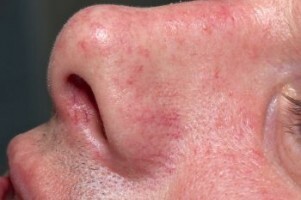 Laser treatments like this are one of the most common treatments for both men and women since broken capillaries like this are quite common at the corners of the nose. Depending on the color and size of the vessels being treated, it is possible that they can disappear after a single session, however, for the best and longest lasting result, we recommend that even if you notice a dramatic reduction in the appearance of the vessel after one treatment, you should follow it up with 1-2 more treatments and ver short interval like evefy 3-4 days after the vessel has closed down. This is the best way to prevent the vessel from reopening since a certain percentage of single-treatment vessel closures are are just temporary spasms of the vessel, and it will eventually reopen if the closure is not completed with a few additional treatments. Before and After laser treatments for broken capillaries in New York by Laser Skin Care Specialist Dr. Nicholas Vendemia, a plastic surgeon in New York City at MAS. If you would like more information about laser skin care options please give us a call at 917-703-7069 or send us a message by clicking here.